On my recent flight back to Singapore from Hong Kong, I chanced upon an in-flight entertainment food program highlighting the culinary gems of Asia and the particular episode shown was on Japan. Predictably, it went on about sushi, sashimi, ramen and bento boxes but one word kept me perked up despite the dehydrating cabin air and shaky turbulence. The concept of kodawari (briefly here) was new to me and it completely explains the perfectionist approach Japanese people have towards the presentation, taste and nutritional balance of their food. The angle a piece of yellow fin tuna is sliced, the way a sushi rice ball is shaped and the composition of a bento lovingly put together - every step involved is carried out and every ingredient is used such for its purposeful objective. I've always been attracted to Japanese cuisine, now I think I finally found the reason why. From a simple bowl of noodles swimming in dashi and my favorite saba yaki to the artful, swift movements of a teppanyaki chef preparing my garlic rice and chawan mushi, Japanese cooking never fails to satisfy both my taste buds and learning curiosity. However, I've never cooked Japanese at home, mainly due to my fear of ingredients and condiments going to waste as we don't cook daily. A couple of hours after landing back home though, I thought this has to change and decided that I would make something Japanese requiring minimal shopping or so God help me. Fish was on my radar in my attempt to lean towards a healthier diet after three weeks of business trip eating fiesta and Lord knows how many additional kilos (no, I haven't the guts to step on a scale yet since I returned). I wanted to exploit the oven to avoid having to wipe down an oil-splattered kitchen - sometimes even the most ardent cook would like to do minimal cleaning. So I thought of teriyaki grilled fish. And I almost thought of a bottle of teriyaki sauce from the supermarket. But, you guessed it, and yes, if you're like me, you'd be wondering if it's possible to make teriyaki sauce from scratch, or at least find out what goes into it - just so if I do grab a bottle off a shelf, I'd know what to look for. Finding Marc's chicken teriyaki made me very happy – I’d only need to get sake and mirin. The simplicity of the recipe exuded authenticity and promised an unadulterated preparation I'd like to employ on my favorite cod loin fillets. Equal parts soy sauce, mirin, sake, and sugar - I was sold. Then Marc went on to mention that ginger and green onions are sometimes used as garnishes. 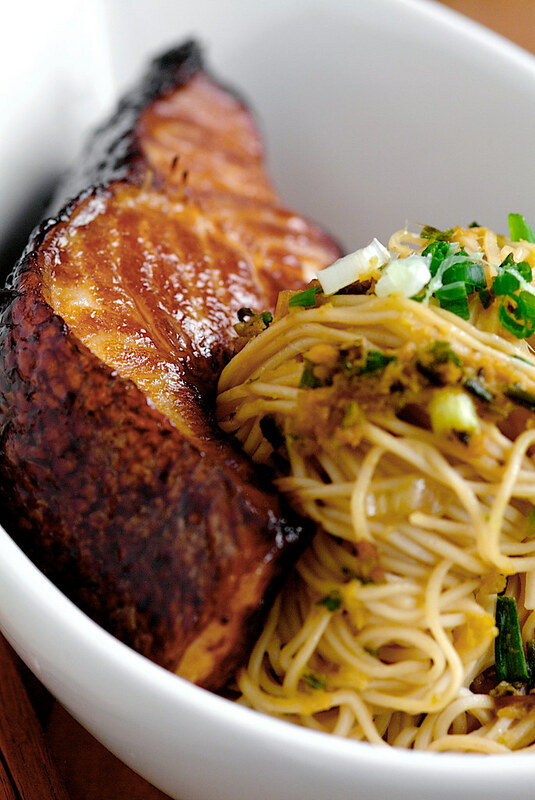 Now wouldn't a serving of ginger scallion noodles be perfect to go with the fish? It was like a priceless moment of Eureka (!) to answer my 'what's for lunch honey' question. I vaguely remember reading something about scallion oil noodles at Bee's Rasa Malaysia and a quick check for ginger scallion noodle sent me to one of my favorite Malaysian Down Under with a much intriguing Momofuku method. I studied both recipes and debated whether it would be great to combine both - hot scallion oil with a bit of Taiwanese influence poured over one of David Chang's mother of all sauces. The thought of how the result would taste made me zoom out the door for the fattest bunch of spring onion and some ginger as quickly as humanly possible. My enthusiasm was equally shared by Vijay, who came running to the kitchen while the scallions were frying and the teriyaki sauce reducing. "What are you making? It smells so good!" he demanded. I told him about the teriyaki bit but not the ginger scallion bit, just to maintain some mystery. The meal turned out to be one of our best homemade lunches; I can't believe it took me so long to explore cooking these flavors at home. Vijay polished up two servings of noodles, knowing well we had an Indian seafood dinner appointment just a few hours away. We ended up with about two tablespoons of the ginger scallion sauce left; I realized next time I do this it'll only make sense to follow the original Momofuku amounts. The last time I cooked a piece of cod I messed up the placement and the fish fanned out quite ceremoniously, so be sure to cook it as you would on the stove, skin side down. While I got the fish right and miraculously managed not to overdo it, I cooked down the teriyaki sauce a tad too much and it turned into gooey teriyaki caramel as it cooled. Thinning it out with some water fixed the sauce yet the intense flavor remained. Adapted barely from Marc Matsumoto's Chicken Teriyaki at No Recipes. 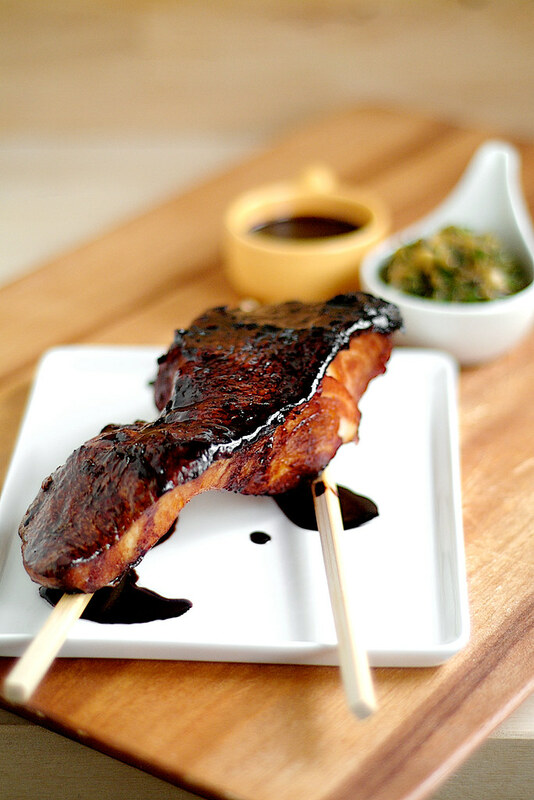 Note: For a halal version of teriyaki, mirin can be replaced with pineapple or apple juice and sake can be replaced with a mixture of water, a little vinegar and some sugar. The sauce recipe consists of equal parts of all the ingredients, so adjust as you need. 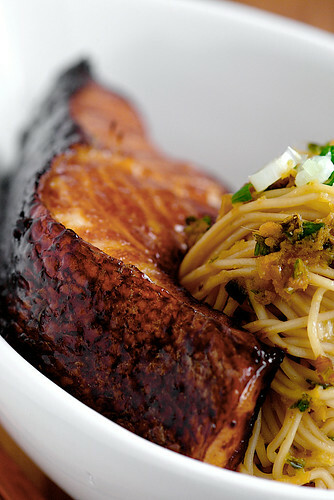 Cod can be replaced with any other oily fish such as saba (mackerel), salmon belly or halibut. Check your fish at the 20 minute mark to avoid overcooking and only baste with the sauce towards the last 10 minutes of cooking time to avoid burning the skin. Combine the water, soy sauce, brown sugar and mirin in large Ziploc bag and add in the fish. Press out as much air as you can and seal the bag. Let this sit in the fridge for at least an hour. Meanwhile prepare the teriyaki sauce. Combine the honey, soy sauce, mirin and sake to a small sauce pan and boil over medium heat until the sauce is glossy and slightly viscous. It should take on a caramelized taste but be careful not to burn it or let it get too thick (it will thicken more as it cools). When you’re ready to grill the fish, turn the broiler on (maximum temperature) and move the oven rack up to the upper third position. Put a wire rack on a baking sheet and place the fish pieces skin side down onto the rack, keeping them elevated off the pan. Grill until brown, about 15 minutes, you can make the ginger scallion noodles (recipe following) during this time. Flip over so that the skin side faces up. Baste the skin side with the teriyaki sauce and continue to broil until the skin is golden brown with just a few charred spots (I divided this portion into two basting sessions, about 5 minutes between each basting so the total cooking time came to about 25 minutes). 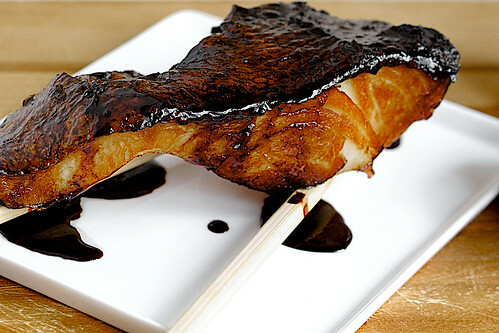 Remove from oven, give the fish one final baste with the teriyaki sauce and rest for 5 minutes. 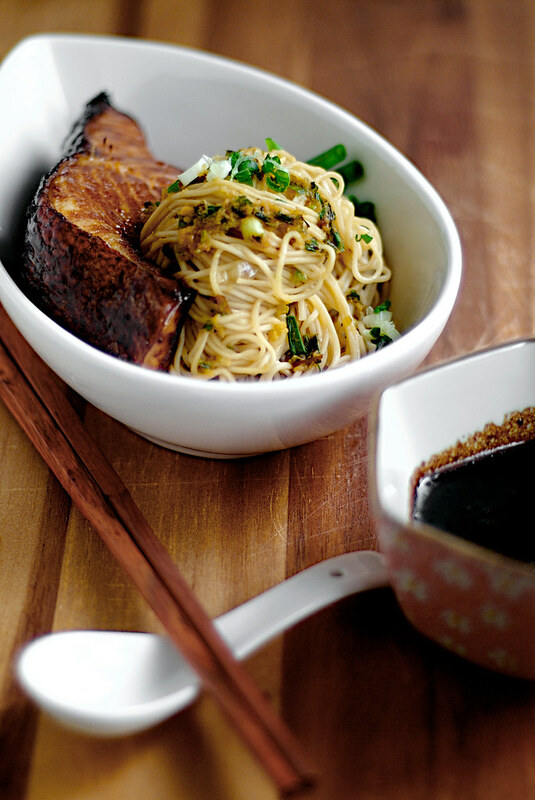 Serve with the ginger scallion noodles, with more sauce on the side for dipping. Adapted from Bee Yinn Low's Taiwanese Scallion Oil Noodles (葱油拌面) at Rasa Malaysia. Bring a saucepan or a small pot of water to boil. Mix all the ingredients except the scallions and the oil in a heatproof bowl. Check and adjust the seasoning. Set aside. Meanwhile, heat up a frying pan or wok with the oil until it begins to smoke. Reduce heat to medium low and add in half of the scallions. Stir continuously with a spatula until aromatic and the scallions are just slightly burned. This will release the full aroma of the scallions and infuse the oil. 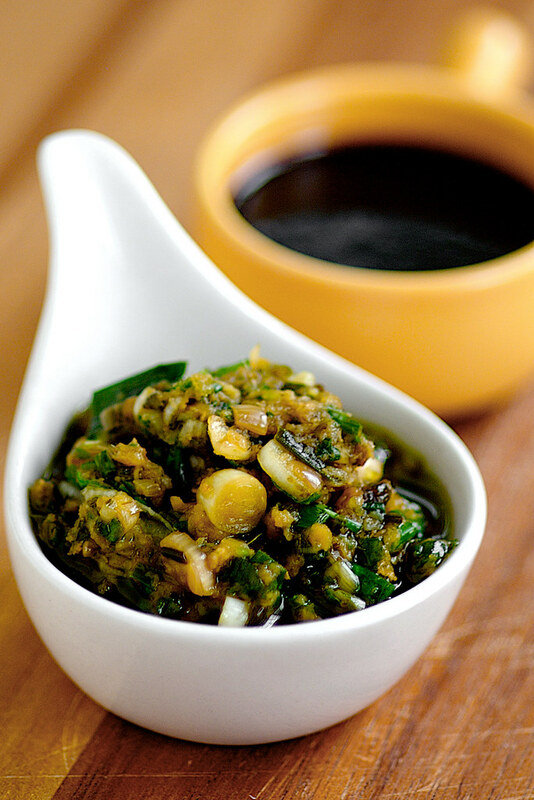 Immediately pour the hot scallion oil into the sauce mixture. Stir well and let stand to cool. Meanwhile, cook the egg noodles in the boiling water (if using pasta, salt the water) for about 2 minutes or till al dente. Drain and transfer into a mixing bowl. Add the remaining half of the sliced scallions into the sauce. Dress the noodles with your desired amount of sauce and toss evenly to coat with a pair of chopsticks. 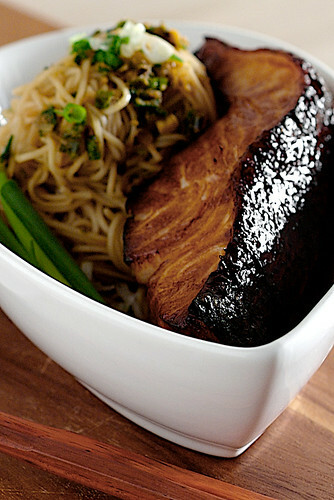 Serve warm with the cod teriyaki. The noodles are also good served at room temperature. Extra sauce can stay refrigerated for up to 2 days. Loved the ginger scallion sauce with the noodles. The cod looks good too but am just a little concerned about having 2 very strong flavored dishes together. you shame me, this is what you have for lunch?? i'm lucky if i have something leftover from the night before, other than that, i grab sandwich or salad. 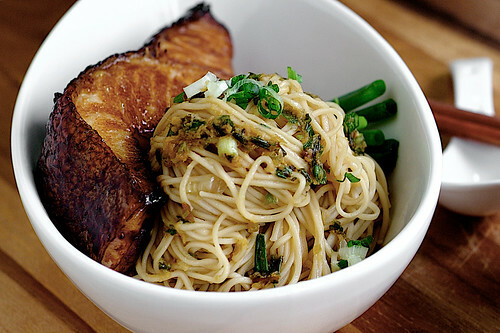 this is beautiful, i don't generally cook with fish but the scallion noodles? swoon-worthy. keropok man: The photos are thanks to my partner in crime who enjoyed his lunch very much. anh: Thanks to the world of food blogs, I get inspired every day by great dishes! Chef Gregoire: The fish is out of this world, if I may say so. Teriyaki makes everything delicious I tell you. shirley: The flavors compliment each other I think. It's not strong in the noodles as the sauce is mixed with the otherwise bland noodle strands and there's little soy in it. Then the teriyaki is mellowed somewhat by the fatty fish. It's a bit like eating garlic fried rice with teppanyaki. Lan: We have lunches like this only when I cook on weekends. On weekdays at work, our lunches are mostly MSG-ladened hawker food. Sherie: Well, I hope you made this for lunch today. There's so much out there to learn about all kinds of food yes? The beauty of food blogging! Japanese cuisine is so delicate, simple and packed full of flavours. One of my favourite cuisines. You've done a good job with the flavours and presentation! The ginger and scallion sauce is good isn't it, craving for some now! Ann: Thank you! Yes, the sauce is awesome. Vijay asked for is again later in the week on one of his vegetarian days. mai: You can also do this with other meats and seafood. mmm ginger scallion noodles! this looks amazing. i also liked you used so many elements from different bloggers, and all whose blog i read! Thanks Alice, all of them rock harmoniously in this dish. Hope your baby is doing well! Looks like a great recipe -- but what's up with the format of your blog? Looks like a mobile site, which makes it very hard to read on a desktop/laptop. My partner and I love fish. He works for a seafood company, and part of his annual bonus is 50 lbs of salmon (with the occasional halibut or crab). This year, he had two large halibut cheeks. I pulled up this recipe (I'd bookmarked it) and cooked the noodles and halibut. He put away a *huge* bowl of food and hugged me afterwards. :) Thank you for putting such a wonderful, delicious recipe together!